Now here’s a tip anyone can use, compliments of my latest post-heated-yoga stupor, but just in time for the tropical summer heat that’s easing over most of the nation. I was the veritable drip-hose of sweat at yoga last night, though I wasn’t alone in my uberdampness (maybe it was the stormy weather). It was disgusting to leave the class with every bit of clothing soaked down to my skin, but then I remembered my camping supplies and its stash of biodegradable hemp-oil soap–best of all, it was peppermint! This stuff has seen a lot of camping trips and the inevitable bad weather that goes with camping, so I automatically associate the smell of the stuff with frostbite. Mix cold weather with cold northern Minnesota lakes, or the most painful water-dip of all (which requires no peppermint soap to enhance the coolness), the streams of Wyoming’s Bighorn Mountains, and you have a Near Death Experience. In any case, I squeegeed myself home from yoga, wrung out my clothes, and took a bath with the amazing Dr. Bronner’s Peppermint Soap. If you’ve never used the stuff before, it’s a religious experience. Not only does it bring the dead back to life—or from heat stroke to hypothermia—but the label is a religious comedy. The blog stops here (though I’ve been a bad blogger lately—my apologies—bad blog! bad blog!). 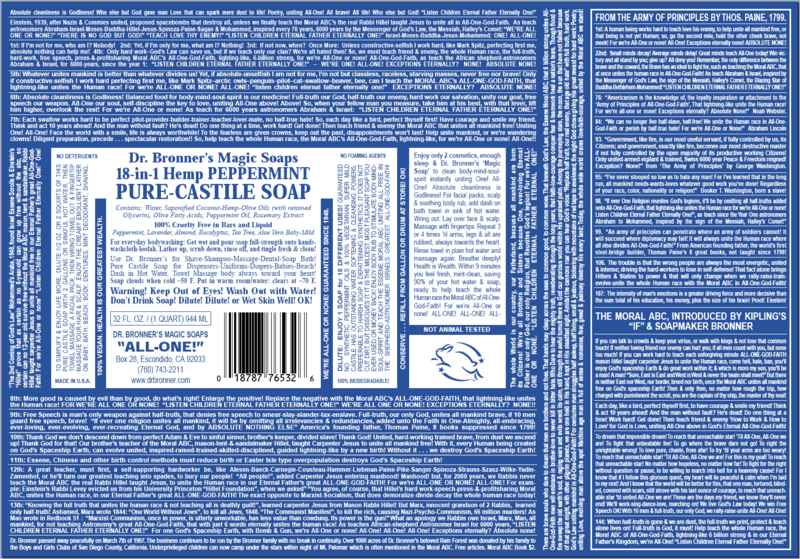 It’s Dr. Bronner’s turn to write. Please don’t strain your neck reading it. ~ by rebuildingholly on May 26, 2012. A friend of mine gave me lemon and peppermint essential oils that you add to your drinking water by the drop–they bring you back to life that way, too! where do you buy this yummy soap? health food store? drug store? supermarket? I’ll look for it on Unplugged Wednesday. PS: I’m enjoying your journey. Thank you! It’s good to know my ranting and raving therapy is appreciated!